Beautiful Ranch Home in the Riverview Neighborhood. This 3 Bedrooms, 2 Bathrooms Home has a Covered Front Porch, Large Bonus Room, One Car Garage and Private Backyard. Home is zoned for Seigel Middle and High School. Beautiful Home in the Stratford Park Neighborhood. Home has an Open Floor Plan and a Large Living Room with a Fireplace. The Large Kitchen has lots of Counter Space, and Island and Stainless Steel Appliances. All the Bedrooms are Large and the Master Bedroom has a Trey Ceiling. Home also has a Large Private Backyard. Immaculate Executive Home in Spring Hill has an Open Floor Plan and a Large Lot. Home has 5 Bedrooms and 4 Bathrooms and lots of Storage and Cabinets. There is also a Beautiful Stone Fireplace. Call to Schedule a Private showing. 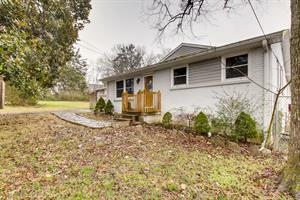 Amazing 3 Bedroom 2 Bath Home in Murfreesboro. Home has a Vaulted Living Room with a Stone Fireplace and Stainless Steel Appliances in the Kitchen. This is a Must See Home with a Covered Front and Back Porch.